Installation view of Theodora Allen 'weald' at Kasmin, January 24 - March 9, 2019. Photography by Diego Flores. The fortress of long-fallen monarchies on a misty moor, or the intersection where the 134 freeway meets the 2, concrete woven like lace. That is where Allen’s work lives, in the barely-there distinction between the ruined and the waiting to be. The second room holds four large paintings that depict the four central symbols of the original tarot from the 15th century, suspended within a classical window motif: half portal, half bell jar. But the objects are discarded, disembodied, overgrown by the same ecosystem of plants she previously catalogued. Tendrils curl around the edges of the image; petals fall from frame. 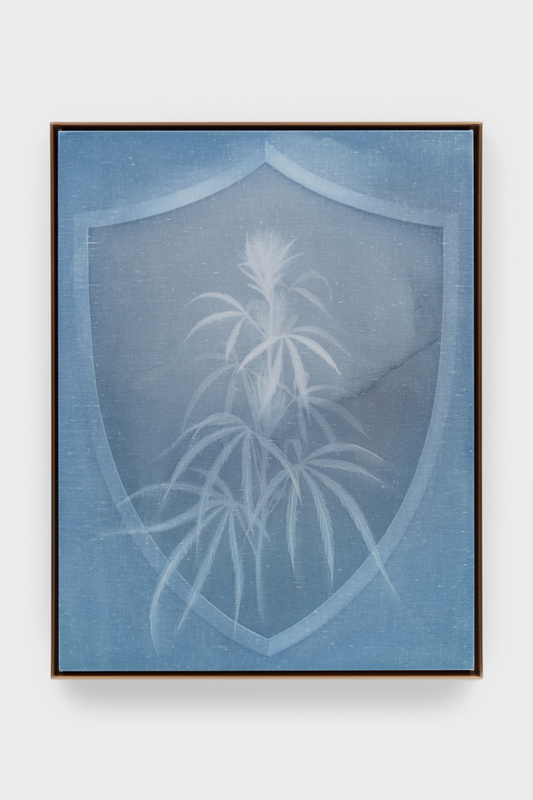 Allen’s Shield (Marijuana), 2018. Courtesy of the artist and Kasmin Gallery. Allen’s process, too, mirrors this liminal space. First, she describes how she leaves “a pool of watercolor which I let evaporate on the canvas. Dependent on climate and weather conditions, the water evaporates at different rates.” The watercolor marks the time of making and is incorporated into the drawing itself: a crack in the stone, a vein of a leaf. Then, Allen builds her hyper-detailed image with layers of oil paint, simultaneously stripping what she has put down as she goes along: “I just add and remove, essentially making and unmaking. It’s like coaxing the image into this place, in between forming and disappearing.” Eventually, the fabric of the canvas starts to wear, resisting the tide-pull of rhythmic application and erasure. Allen embraces what she calls “the un-wieldiness of the materials,” but usually, when an artist commits to letting organic conditions dictate the shape of the work, they end up in deep abstraction, not the realm of botanical illustration. But Allen is persistently figurative, however evanescent. The references of the show—the medieval iconography, Pre-Raphaelite mythos, fin de siècle filigree, 1970s psychedelia—are all historical moments where artists pulled the past up to meet them, as the end of the world seemed newly within reach. But here, each apocalypse blurs in the blue of twilight. The world continues. Her haunting pharmakon blooms, no matter the soil.